Welcome to our third construction update for The Schrödinger Building, our £13 million new state of the art office & laboratory building near to The Sadler Building. Our contractor, Barnwood Construction, has been making good progress with the building with the steel frame now complete. All the pre-cast concrete stairs have been installed so the building’s outline is now clearly visible. Work has started on the metal floor decking that will provide the formwork for the concrete floors. These are now being poured. Externally the base of the car park area around the building has been formed and covered with tarmac to allow a clean working surface for the construction period. The car park area to the front of the building has also been dug out to formation level. In addition the landscape bund near to The Sadler Building has been re-graded to accommodate new granite bench feature that will run the length of the bund, providing another external collaborative space for the Park. The tree pits have been formed and the foundation has been cast for the new granite benching that will run the length of the existing landscaped bund. Work will be soon starting to install the roof decking to the building. 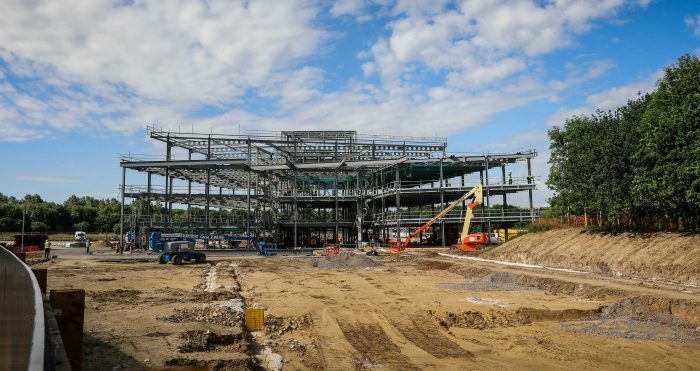 The external envelope is due to begin in early July, so the next few months should be very exciting as the building begins to take shape and its external appearance becomes a reality. The building will be wind and watertight by the Autumn. Watch our new time-lapse video to see the building take shape. You can read more about the building by downloading the new The Schrodinger Building’s brochure. A reminder that viewing points have been installed in a number of places around the hoarding, so please do take a look and see for yourself the progress.